Stockfish is dried, unsalted cod. At first glance, these seem to be simple pleasures that any young bohemian might enjoy. The deleted ‘Religion’ might be have been a provocative idea about which he had second thoughts, but what on earth can that ‘Stockfish’ be? It is so bizarre that I thought it could be a mistake on Balfour’s part. Harry Ransom Center, The University of Texas at Austin, Manuscript Collection MS-4035, Box 1, Folder 5 (‘Notes and Fragments’), p. 1 (top of page). Stockfish. take posterity on our backs. Act straight for | today, and remember that your theory for posterity will be | wrong. Better a straw fire of popularity than t other thing. Stockfish again. Something tells me Balfour didn’t make a mistake. And this too is apparently connected with stockfish. And at the bottom of the page, we have some more ethical advice, here not about the choice of conduct but about judging it: some vices are low and beastly, but others have ‘generous’ aspects (perhaps involving nobility and self respect). What has ethical advice got to do with stockfish? (By the way, don’t start thinking that I’m going to find the answer to that question.) Perhaps we can get some clues from other uses of the word. Stevenson rarely uses the word. In ‘The Wreath of Immortelles’ (1870) he says the talk of fishmongers runs ‘usually on stock-fish and haddocks’. Fair enough. And in Weir of Hermiston (1894), the older Kirstie gives her opinion of Gib the weaver: “He’s maybe no more stockfish than his neeghbours! He rade wi’ the rest o’ them and had a good stomach to the work, by a’ that I hear!” (ch. V ‘Winter on the Moors’, 1. ‘At Hermiston’). Here, ‘stockfish’ clearly means ‘a stiff, unemotional person’ , by analogy with dried cod (and maybe Kirstie means to say ‘stockish’ and says ‘stockfish’ by applying a kind of folk etymology). the stockfish-souled reader (B. S. Naylor, Time and Truth Reconciling the Moral and Religious World to Shakespeare (London, 1854), ch. 12, 168. 6. So, what does it mean here? Assuming that Stevenson is using ‘stockfish’ in this tradition, we can imagine he might be adopting it for a common target of his social criticism in the 1870s: conventional, respectable, ‘stuffed shirts’, people lacking in imagination, flexibility and tolerance. 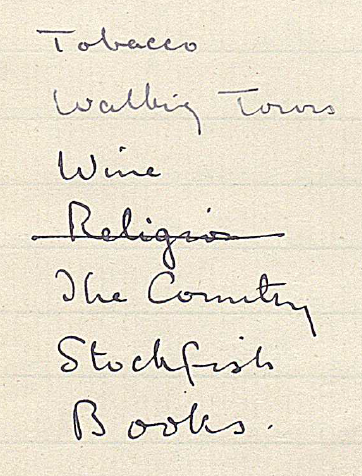 In the list apparently of essays on simple pleasures (Tobacco, Walking Tours, Wine…), ‘Stockfish’ must be an odd thought for an essay, perhaps one summarizing his thoughts on respectable society. In the page of notes in the Harry Ransom Center, the annotation ‘stockfish’ seems to be attached to conduct contrasted with the that of respectable society. All I can suggest is that these notes made him think of negative conduct and judgments to be dealt with in the ‘Stockfish’ section or chapter. Hmm, not very satisfying as explanations. But can anyone think of anything better?